Ahoghill Thistle and Harryville Homers both have a chance to land Ballymena Saturday Morning League silverware this Saturday. It promises to be another fascinating weekend in the firmus energy Ballymena Saturday Morning League, with league and cup silverware up for grabs. Harryville Homers will clinch a fourth successive Division One title if they can take one point from their two remaing league games. Robert Duddy’s men put one hand on the trophy when they defeated nearest challengers Ahoghill Thistle by three goals to one on Thursday night. 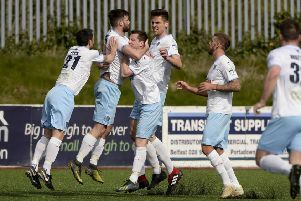 In Thistle’s last league fixture, they needed to win to open a six-point lead which would have meant Homers winning their last two games in order to force a play-off for the title. However, three goals in a whirlwind opening 11 minutes put the game beyond Thistle and with the victory taking Homers level on points at the top of the table, it will be an extraordinary collapse if they lose both remaining games. Meanwhile, Saturday also sees the final of the Ace Cup take place at Connor (12.30pm), between last years winners Ahoghill Thistle and All Saints Old Boys. Holders Thistle qualified for the final with a comfortable 2-0 win over Carniny Rangers with the two goals coming from Ryan Sands. Manager Stewart McDonald will be hoping keeper Stephen Watson can continue the form he has shown of late, while Thistle have a wealth of experience at the back with former Wakehurst players Gavin Gilmore and Gareth Dickey providing great strength. David Drummond is rare breed as he is a left back, who is predominantly right footed, but this does not prevent him from driving forward and he also can chip in with the odd goal. Thistle have an array of talent in midfield with Captain Jason Stewart providing the anchor allowing Randal Reid and Gavin Kernohan to influence the game. On the wings it’s normally semi final hero Ryan Sands on the right, with George Courtney or the pacy Paul Aiken coming off the left. Thistle will be hoping main striker Matt Boyd can fire them to glory and with the experienced David Tennant to come off the bench Thistle are always a threat. Saints overcome Newpark Olympic with a 3-0 score line in their semi final to reach their first final in three years and one of the few survivors from that Ace Cup win is experienced keeper Brian Martin. Chris Wilkinson has proved to be a major player for Saints at centre half this season and he has been partnered by youngster Noel Crossey who never looks fazed. In midfield Saints have bags of energy with the youthful pair of Peter McReynolds and Gordon Dillon driving their side on. Alan Telford and Ryan Gregg provide the creative spark for Saints. Manager Eoin Hudson hopes striker Liam Cassley can make a speedy recovery from injury, with Aaron Wilkinson, Joe Scullion, Brain Paul Donnelly and veteran Gavin Burnside also contending for frontline spots.